Mustang's new line of Deluxe Inflatable PFD'S combine the advanced safety of inflatable technology with new product enhancements such as a safety inspection window to readily tell users if the inflator is ready for use and a neoprene comfort collar to eliminate neck irritation, to offer a superior inflatable PFD. 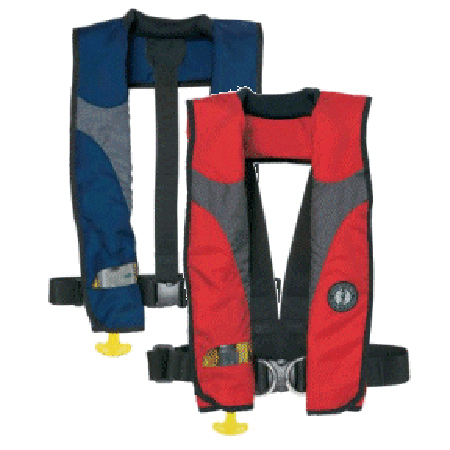 Made with an integrated sailing harness for extra safety, the MD3084 is designed specifically for sailors frequenting rough weather. The MD3084 automatically inflates when the wearer is immersed in water and is lightweight and close-fitting to ensure it doesn't interfere with regular sailing activities. #MTMD3084 CANNOT BE SHIPPED VIA AIR. PLEASE ALLOW TIME FOR GROUND SHIPPING WHEN ORDERING.